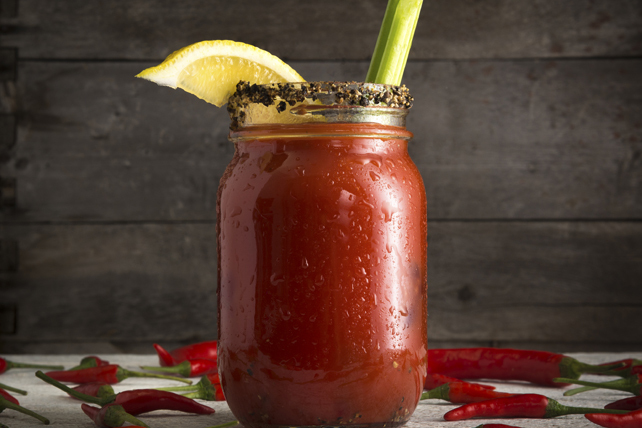 Our LEA & PERRINS Caesar is a delicious take on the classic Canadian favourite. Enjoy with friends or family at your next backyard get-together. Sprinkle black pepper onto small plate. Rub 1 lemon wedge around rims of 4 glasses. Dip rims of glasses, 1 at a time, into pepper, turning to evenly coat rim of each glass. Add ice. Mix tomato juice, vodka, Worcestershire sauce and hot pepper sauce in glass or plastic pitcher until blended. Pour into prepared glasses. Add celery stalks. Garnish with remaining lemon wedges. Serve with your favourite grilled meat. Substitute additional tomato juice for the vodka. Season prepared drink in pitcher, or in each filled glass, with additional Worcestershire sauce and/or hot pepper sauce to taste.